One chief feature of our Society, from its beginning, has been that of a refusal actively to pay “tithes, priests’ demands, and those called church rates.” This peculiar scruple, which the Society has agreed to call a testimony, has been the cause of much personal suffering at former periods; but as it has long, in some degree or other, had its dissentients, it has been productive of continual breaches of harmony. It happened, as will appear at some length, to be one of those topics, on which I was obliged to think differently from many of my brethren: Not that I ever thought less than they, that the tithe institution was incompatible with the spirit of the Gospel ministry. In that, and in the strongest objection against war, and of course against taxes to support it, I have not been a whit behind the chiefest of them in the reality of my testimony. But in my ideas of the proper and consistent use of that testimony, I have reluctantly been obliged to differ from the public professions and distinctions of the body. So circumstanced, I could not act the part of an insincere conformist; I could not satisfactorily be silent on the subject of my dissent. This, it will be supposed by others, as it is known to my acquaintance, occasioned me first an unquiet, and then a detached situation. But after an intervention of many years, the bond of love and good-will towards the general body, as towards numerous individuals of it, remains unbroken. We “love as brethren” still; and what I deem the main principles of Christianity, as held by our ancient Friends, are principles which I cherish and revere. 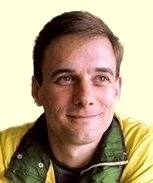 …it is not my intention to take a decisive part in a question, about which so many sensible, pious, and respectable members of our community are not agreed; but briefly to state the reasons, why many conscientious and valuable persons under our name cannot profess a conscientious scruple against paying those demands. It is well known that, as a society, we have been long professing a public testimony against the lawfulness of Tithes; and I am persuaded many among us, who dissent in that testimony, are fully apprised of the ground on which our forefathers proceeded, with a view, no doubt, to disencumber Christianity of a burden which they thought unsuitable to its spiritual dignity; are sensible of the sufferings they underwent, and of the patience they manifested in bearing their testimony to the world. And lastly, that such dissenting members sincerely wish to shew to those considerations all the regard they can, consistently with the dictates of that private judgment, which alone they are constrained to think binding on them as individuals. They are no strangers to the arguments of their predecessors, or those of more modern date, as follows, viz. Tithes are different from a payment for services — they are an institution of government-created artificial property that is a fundamental part of the economy and of the valuation of titles and land: in effect, when you purchase property you are only purchasing the full rights to a tithe-free portion of it (and its price reflects this as a discount over what the price of the full property would have been) while the tithe-owned portion of the property remains unsold, and you are liable for the difference — if you try to evade the tithe, you are claiming more property than you actually purchased or rented. Tithes are traded on the market, and some thereby become owned by people having nothing to do with the church (so people who pay such tithes are not paying for a hireling ministry at all, but paying an investor in a government-fabricated rent-seeking scheme). Matthews answers that certainly a property-owning ancestor of ours could have given away or sold all of a piece of property to someone without the consent of his entire tree of descendants — why then could that ancestor not have given away or sold part of that property in the form of a tithe due on the whole? (He is assuming, for the sake of this argument, that the tithe institution originated as something consented to by the population being tithed, which I’m sure is historically suspect.) And why should it matter whether this ancestor sold or gave an interest in his property to a priest or to a layman? In other words, what makes tithes any more historically suspect on this count than any other form of rent? Our tithe-payers, after long consideration of the subject, find themselves utterly at a loss to reconcile the seeming inconsistency that appears among the faithful part of our society, in professing a religious scruple against an hireling ministry, and against tithes to support it; while they so readily, yea without the least hesitation, pay an additional land or other tax, when imposed ever so expressly for carrying on wars and fightings: As though the Christian religion were less dishonoured by the unrelenting lust of ambitious princes — the desolating plans of projecting ministers — and the sanguinary progress of hireling destroyers, than by hireling ministers of peace! Tithe-payers have considered this subject as a most interesting one, and have sought satisfaction with much solicitude. For though in the whole New Testament they find no commandment against the payment of tithes and ecclesiastical demands, they find the Christian religion uniformly represented as a religion of love, of brotherly kindness, and forgiveness of injuries. Consequently, as they think, a testimony against wars and fightings, and a positive refusal to pay taxes for the carrying of them on, must be abundantly more defensible on the Christian precepts, than a refusal to pay taxes for purposes professedly religious and peaceable. They have read, indeed, and it has been told them, We have a testimony against wars also; why then so inconsistently pay to the support of them? If it be replied, as it has been again and again, “that we have the example of Jesus Christ (who paid tribute to Cæsar) for paying kings, or government taxes, and are bound so to do by his injunction, Render unto Cæsar the things that are Cæsar’s; — that we are not accountable for the abuse of tribute paid for the only purpose of righteous government;” let it (say our tithe-payers) then, be said aloud, and let it be heard with attention, that the preambles to acts of parliament, as well as the circumstances of times, often tell us plainly enough what new taxes are levied for:* That even Cæsar, or government in any country, has no claim of tribute, but what the original compact or standing agreement of that country give it: Such is the ground or claim, and such the obligation to pay. This original compact and standing agreement are equally the ground and support of tithes; therefore, in a legal sense, are equally due. All the difference lies in the nature of the object; but that difference is against the Quaker — For, while he readily contributes to the waging of war, he refuses legal aid to the professors of the gospel of peace! Joseph Phipps wrote a rebuttal to these arguments, which was distributed by the Society of Friends to prop up the orthodox opinion on tithe-paying. (I haven’t yet found these, alas.) 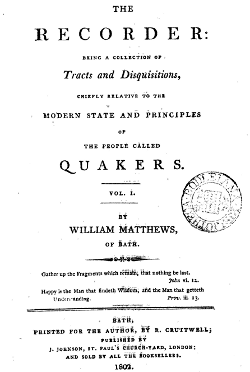 Matthews was disowned for his views and continued on as a Quaker without a Meeting, agitating for reform from outside. He then wrote a tract that largely, on the tithe question at least, restated and expanded the points he’d previously made: When the rulers of antiquity had established property rights and set up institutions to defend and adjudicate them, one of the things they did was to give a certain share of property to the church. This was no more or less arbitrary than many of the other establishments of property made in antiquity, and no more or less deserving of our respect. Quakers are bound to respect the law unless they are conscientiously convinced that to do otherwise is a duty to God, but such a conscientious dictate is a personal matter and not a matter of conforming to an orthodox opinion, and therefore should not be a subject of discipline. Simply being opposed in principle to the idea of a “hireling ministry” is no justification for violating the property rights of current tithe-right owners. [Among my reasons for being dissatisfied with the orthodox opinion is] Because it may be thought especially reasonable by others, who advert to the submissive and peaceable spirit of Christianity, as laid down by our Lord himself, that however they may disapprove of the lucrative establishment of a national clergy, and the luxury and irreligious indolence of some of that order; yet, as the kingdom of Jesus Christ is not of this world, nor his peaceable religion to be maintained by strife about outward things, they are bound to regard, in this matter, the apostolical injunction, “Submit yourselves to every ordinance of man for the Lord’s sake;” well knowing, that by not opposing violence (if for argument’s sake, the national tax of tenths be violence) they should have no hand in promoting that violence; and therefore will have nothing to answer for on that account: at least nothing more than by submitting actively to pay many other national taxes, levied in time of war, and perpetually known to be laid for carrying on the evil work of shedding human blood! — A work mostly begun and pursued in the wickedness of human pride, and that lust of revenge which stands directly opposed to all Christian purity; — a lust coming from the influence of the Prince of Darkness, and of all abominations! Many will continue seriously to believe, that if, for the sake of national order, and submission to national authority, they must pay in the one case, they are at least as much obligated, in the character of simple Christians, to pay in the other. I am fully apprized of the force of all the distinctions which have been made between these claims and the grounds on which all taxes, not for the use of the clergy, are admitted, as right and proper to be paid by a peaceable Quaker, — who is said to have no business with political disquisitions. But many think, that a time will come, when so full a submission in one case, and so full an opposition in the other, will be found to make but little of the genuine consistency of the Christian character! [W]hen we bring tithes to the test of Christian purity, condemn them by the simple standard of truth and righteousness which our Lord sat up, — and maintain that, because so condemnable, they are at all events, and under all present circumstances, to be resisted in toto; we act partially and inconsistently, unless we advert to the purity and righteousness of his laws in all other public matters, and square our conduct by the same rule. This I state as a general principle, without an adherence to which we cannot lay a valid claim to consistency of religious character. Nothing can be more clear than that the vital spirit of Christianity is totally repugnant to evil provocation, revenge, violence, and the military murder of armed hosts! But these are practised in professed Christian countries with as much promptitude, as though they were the real duties of the Christian religion! I know you lament, in much heaviness of soul, this miserable defection from the true dignity of men and Christians! Could universal love and peace be established by your prayers, or your sufferings, I know you would rejoice “with joy unspeakable.” But the time of this perfection in society is not yet come! — and though the enormities in question could not be carried on without the contributions of the people, — I do not say that under the general precept of “submission to the powers that be,” (because the power, or general principle, of government, is ordained of God) you or I are warranted in refusing to be taxed, among other objects, for purposes of war! You seem to have agreed, and I will not controvert the general principle, that in matters of government, however inclusive of taxation for war, you are to be active in your submission. But I must, and do, most seriously contend, that uniformly and actively to comply with demands of this nature, known to be stained through and through with blood; and yet to excommunicate your own members for paying tithe-demands, in obedience only to the laws of the same government, — is a dilemma of inconsistency, from which the power of reason cannot deliver you! [The Society of Friends’] principles of peaceable submission, and attachment to the civil governments under which you have lived, both before and since the Revolution of 1688 , have been always remarkable. You have addressed your submission and allegiance to all the successive princes on the throne — and in all civil matters have appeared emulous to be considered as loyal, contributing to the expences of government as far as your professed “testimony against wars and fightings” would possibly allow you to be active. This disposition you particularly evinced, by your voluntary contribution for flannel waistcoats to the army of the North, while repelling the invasion of 1745 . That contribution was well received by government; while it was considered by some persons as bordering on a temporising conduct, — and of late years, as not according with the strictness of your assumed “testimony” against the support of a militia, for a specific provision against invasion, and for home defence. However equivocal your conduct in these matters may appear; however reconcilable, or otherwise, with the strictness of your testimony against paying a tax, which government had long before settled on your lands, for the support and clothing of priests; you never before were called upon for contributions, equally large, definitive, and trying, with those of the present period!1 The present period seems to have been reserved by a wise and superintending Providence, for bringing the rectitude of many men, and many measures, to a close and serious test. In this general trial of rectitude and consistency, you are deeply involved. Your ground of action, in comparison with that of some other descriptions of men, is indeed apparently simple and contracted; and much confined within the sphere of your own society. But you have a part of some importance to act: your wisdom and consistency, in the conjuncture, will be of some consequence to your credit in the serious part of the world; and more particularly so, respecting your own internal government, and the “testimonies” you profess to bear. You are now called upon to pay large contributions, not for the general purposes of regular and ordinary civil government, but, avowedly, for the specific purpose of carrying on war; and a war, too, which has been, beyond all former example, sanguinary and destructive to the human species! — Tithe-demands you hold to be contrary to the spirit of the religion in Christ, inconsistent in their origin, and, as you think, in their tendency, with the simplicity and disinterested love of that religion; and therefore you refuse to pay them.… But if you feel it your duty to refuse a compliance (or, as you term it, an active compliance) with the laws of the land, that you may not be chargeable even with indirectly aiding what you suppose the law of Christ is against; how will you consistently pay, with active hands, in common with the abettors of war in general, and of the present most melancholy war in particular, whatever is demanded of you under the head of “the Assessed Taxes” already imposed, and those others which will doubtless be soon imposed, for the express purpose of continuing this war with increased vigor? Act for Granting to His Majesty an Aid and Contribution, for the Prosecution of the War! We your Majesty’s most dutiful and loyal subjects, the Commons of Great-Britain in Parliament assembled, feeling it our indispensable duty, at the present crisis, to provide effectually for raising the supplies, which are requisite to defray your Majesty’s public expenses in the prosecution of the just and necessary War in which we are engaged, &c. &c.
You do, indeed, enjoin your members to refuse an active payment of militia-money, when demanded of you as such, in lieu of bearing arms, for home-defence. So far your conduct is consistent with your original scruples, in the matter of tithes; but the much larger demands upon you, expressly for the purpose of more offensive, general, and, as you well know, of destructive and sanguinary warfare, you comply with, without any apparent scruple at all. And comply you must! But in this part of the statement, I will not permit the supposition to rest for a moment, that you are intentionally friends, directly or indirectly, to any kinds of warfare; — I know the contrary to be the very truth: you mourn, as real Christians, over such misery of human nature! I know you profess not to make political matters the subjects of your society discussion — or to appreciate the merits, or comparative demerits, of national quarrels, and war policy. You profess to be under the superior government of the Prince of Peace, and to have nothing to do with questions of carnage and destruction. But such questions have now much to do with your pockets, and the exemplification of your principles. And yet, such is your situation, that under the general injunction to submit yourselves to the ordinances of the ruling powers that be, you cannot refuse to pay the legal assessments, without incurring penalties, which you will not consider yourselves as called on to incur! In your case, — the whole is a series of implicit submission, either with or without a rational construction of general obedience. The situation may be painful, and doubtless you have felt it — but you must and will, on the general principle of submission to government, pay and submit! — Neither do I see how you can continue your customary censure and excommunication of those who, in active obedience, pay the specific demands for raising the militia! Any shades of difference which you may attempt to define, in favour of paying the new “assessed taxes,”2 you will henceforward so attempt, with small satisfaction to yourselves; and in the estimation of other men, the most accustomed to reason correctly on general matters of importance, — your arguments to that point must utterly fail. 1 In 1798 , when a triple assessment of government taxes was levied; but which was soon after repealed, to make way for a general tax on Income, for carrying on the most wide and expensive plan of war, that ever this country saw. — It is not, however, to be understood that I lay more stress on the magnitude of this unhappy war, than on the radical evil of the war-principle; or that I call on my friends to do so: But when the enormous evil of that principle is so mournfully exemplified, it becomes proper to argue from the horrid consequences, as well as from the principle itself. 2 The same reasoning applied afterwards to that enormous call, the Income Tax, — which was substituted, professedly on the same war-principles. Matthews seems unaware that the same contradiction he exposes here as a reductio was advanced by Quakers in America (and some in England as well) as an argument for extending the Quaker resistance to tithes and a hireling ministry to also cover resistance to war taxes. I would not be surprised to find that his arguments, though intended to end support for tithe resistance and not at all to promote war tax resistance, helped contribute to the growth of war tax resistance among Quakers. [3rd Month] 23rd  — Went on through a part of Oxfordshire to Evesham, a large market-town in Worcestershire, where there are a few Friends and a meeting. Friends here were under a good deal of concern, as I have found in many other places, about paying taxes declared to be for the express purpose of carrying on the war. I think our peaceable testimony is so much concerned in it, that many Friends will find it the way to peace, to suffer, rather than actively comply: it will no doubt be a trying time to many, through which I hope the standard will be held up a little higher against the horrid practice of war, than has yet been the case in England. [4th Month] 16th — Got on to Liverpool, and on the 17th was at the meeting of ministers and elders, and it appeared to be a profitable season. At the Quarterly Meeting for Discipline, the subject of paying taxes for the support of war was considered, and it appeared that many Friends were much straitened in their minds about the practice, in most of the Quarters in the nation. I’m familiar with at least one case from around this time when a young British Quaker went to jail rather than pay his war tax. I expect if I looked a little harder I’d find more.